Trek Ecuador's famed Avenue of the Volcanoes. Get 6 months to pay $1,035.00 with PayPal Credit! No payments + no interest if paid in full in 6 months. Get off the beaten path and trek remote, unspoiled trails through the heart of the Ecuadorian highlands. Trek through the mighty Andes of Ecuador on this epic 8-day adventure. Discover an incredible world of stunning mountain landscapes, massive volcanoes, hidden rural villages, and rich indigenous cultures. All of this beauty comes together to shape the famous Avenue of the Volcanoes in the Ecuadorian highlands. This trekking adventure will transport you into the heart of the Andean culture to experience the local way of living as you hike narrow, pristine trails used by the local mountain people. 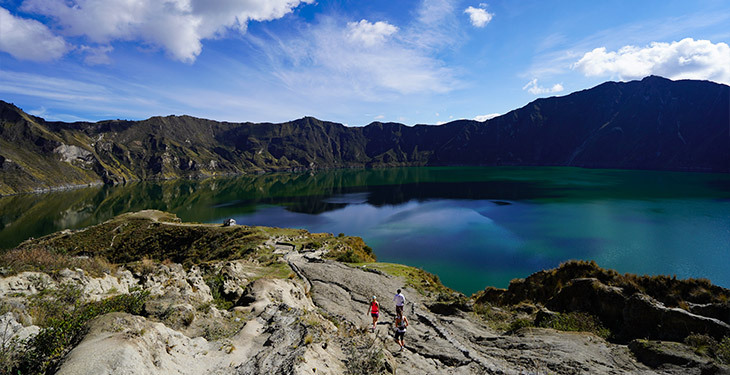 Trek for 3 days to reach Quilotoa Volcano, hike down the base of the Quilotoa Caldera and swim in its volcanic waters. 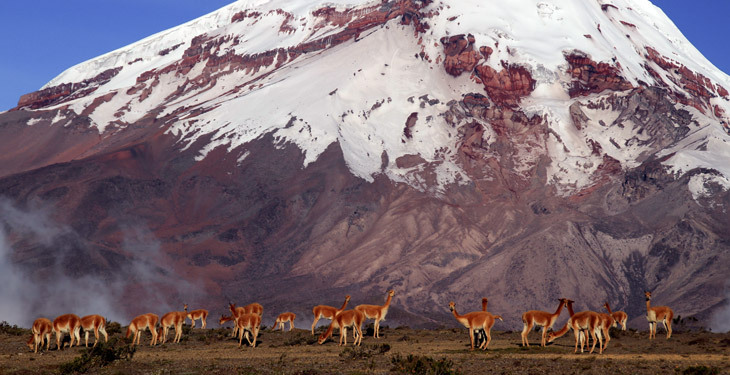 Hike up to the glaciers at more than 16,400 feet on snow-capped Chimborazo, the highest volcano in Ecuador, and keep an eye out for the wild alpacas and vicuñas that live here. Discover legends and secrets from the locals, who consider the volcanoes to be hidden gods. Unwind by soaking in volcanic hot springs and exploring the outdoor mecca of Baños. 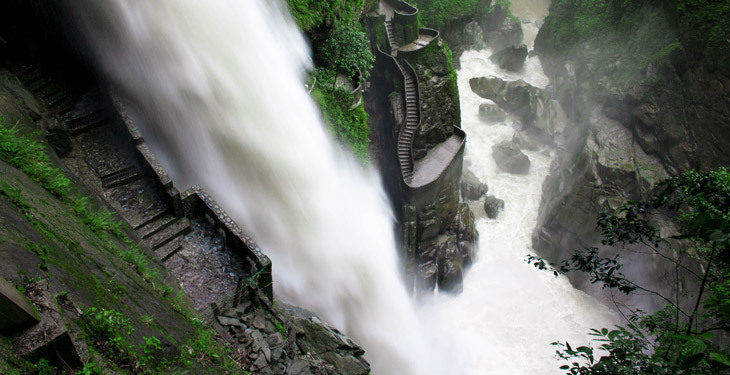 Explore Llanganates National Park and travel the Road of Waterfalls, including a hike to the Pailon del Diablo on the Rio Pastaza, which cascades over 250 feet through a rugged rainforest canyon. End each action-packed day with a much-welcomed bed in a local hotel or eco-hostel. Welcome to Quito! The largest and best-preserved colonial city in America, Quito is a UNESCO World Heritage site and Ecuador’s capital. It’s considered the cultural capital of South America and is located on the equator in a valley at the foothills of the Pichincha volcano. Depending on your arrival time, you can spend the day exploring the old town of Quito and the surrounding area. Because of its strategic location in the middle of the Andes, you can organize a number of fantastic day trips. Contact Adventure Journeys in advance if you would like to organize any of these optional activities or excursions. In the evening, one of your trip leaders will meet you at the hotel lobby for a welcome briefing at 6:00 pm where they will discuss details about the trip and answer any questions you may have. Afterwards, enjoy dinner with the group. 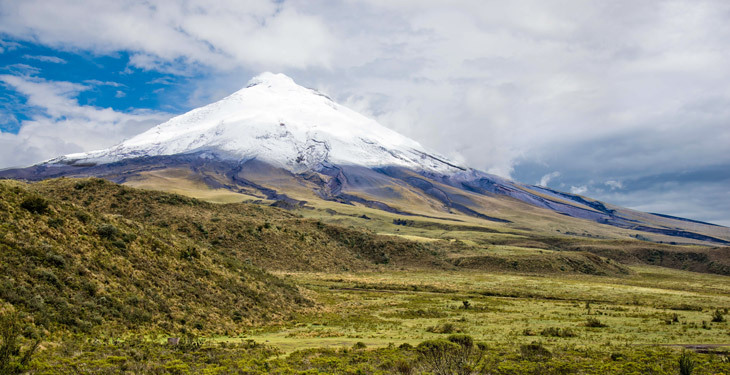 Meet your guide at the hotel lobby and head south from Quito to Cotopaxi National Park. Once you arrive, you'll hike around Limpiopungo lagoon (13,000 ft / 3,800 m) on the foothills of the Rumiñahui volcano and have the chance to see wild horses, wild bulls, and local bird species. From here, you'll have the best views of Cotopaxi, the highest active volcano in the world. If weather conditions permit, you'll attempt to trek to the basecamp at 16,000 feet (4,876 m). The day will end with a drive into Isinlivi where you'll spend the night. Trek along the Toachi Canyon through charming Andean mountain landscapes and experience stunning views of small villages and indigenous people working in the fields. Hike down into the Toachi river canyon, and then back up to the main road that will take you to Chugchilán, a small town located on the middle of the Quilotoa loop. Here you'll find your eco-house accommodations, and in the afternoon, feel free to explore the village with the great opportunity to share a bit of cultural experience with the locals. After a nice breakfast early in the morning, start today's hike on the centuries-old mountain trails. These small trails are still used by locals for commerce and trading as they travel across canyons to reach neighboring communities. While trekking on this trail, you'll often see traders bartering for goods in the traditional manner. 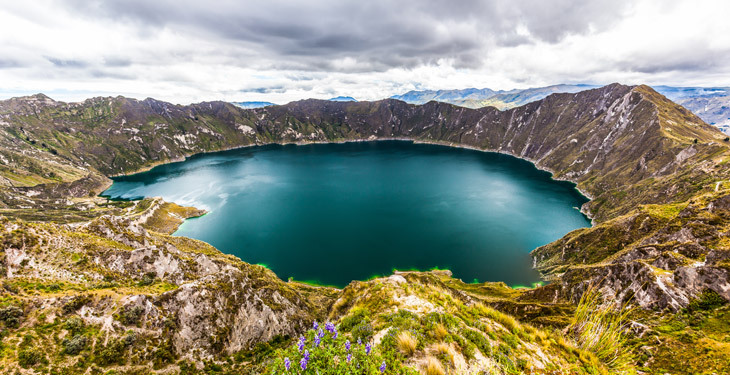 Hike down across impressive canyons before climbing up to the crater rim, where you'll be rewarded with spectacular views of Quilotoa Lake. The magic of this place will take your breath away. Enjoy a beautiful picnic with views of the volcano and transfer 2.5 hours to a magical hacienda in the foothills of Chimborazo volcano. Early in the morning, you'll drive through valleys and farming villages to reach Chimborazo Volcano. Standing at an impressive 20,702 feet (6,310 m) above sea level, this is the highest mountain in Ecuador and on a clear day, the majestic peak dominates the view for many miles. Chimborazo's location along the equatorial bulge makes its summit the farthest terrestrial point from the Earth's center. Today's visit to this spectacular national park includes a short half-mile hike to reach an elevation of 16,404 feet (5000 m) where the glacier begins. Along the way, you'll try to spot a few of the animals that inhabit this volcanic climate such as the Andean condor, caracara, hummingbirds, and the timid wild vicuñas. Once extinct in Ecuador, vicuñas were reintroduced into the wild and are now protected. Enjoy a delicious picnic at the base camp before heading down to a more tropical climate in the city of Baños. Today you'll trek in Llanganates National Park, famous for its amazing landscapes and storied mystery. Legend has it that the Inca General Rumiñahui has a large sum of gold hidden somewhere in the Tungurahua mountain range. Expect stunning views of the Tungurahua Volcano and the Sangay Volcano (if visibility is good) and witness how the vegetation changes as you trek through different elevations. After this beautiful trek, return to Baños to spend one last night in this magical town. In the evening, enjoy a nice soak in the famous hot springs and, if you wish, experience the thriving nightlife of the town. Wake up for you last morning in Baños. Known for its spectacular location right at the foothills of the active Tungurahua volcano, it is one of the most popular destinations for travelers in the country and you'll find many Ecuadorian families vacationing here. One look at this delightfully green mountain town and you'll know why. This pleasant, unspoiled town is the perfect setting for outdoor adventure. Activities include horseback riding, canyoning, hiking, mountain biking, climbing and rafting in the surrounding mountains and on the River Pastaza. This morning, enjoy the beautiful scenery of the cloud forest and journey to the Road of the Waterfalls. 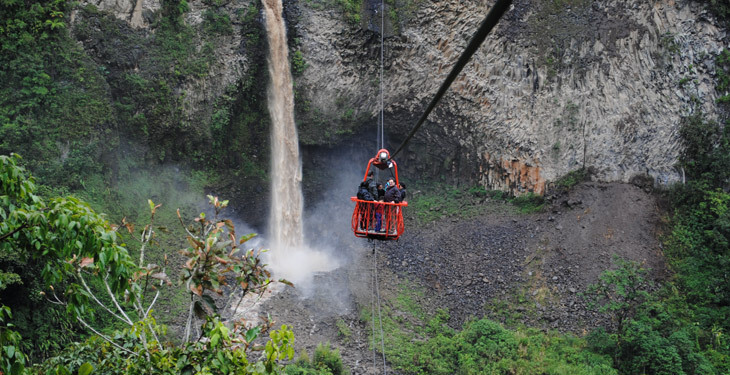 Your first stop is Bride's Veil waterfall, where you can cross the Pastaza River by taking the tarabita (cable car). Then, you'll hike down for one hour to the Pailon del Diablo waterfall, the second highest in Ecuador. After a day full of adventures in the cloud forest, enjoy the scenic ride back to Quito. Say goodbye to Ecuador and transfer to the Quito airport as needed for your flight departure back home. 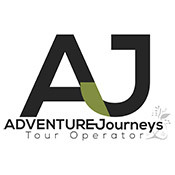 Adventure Journeys was created by a group of knowledgeable expert leaders who offer the most amazing group adventure experiences and tailor-made trips that are adjustable to the needs and requests of their guests. Their mission is to achieve customer satisfaction through a unique client-centered philosophy. Their clients’ happiness, enjoyment, and education are the cornerstones of the company’s reputation and success. Adventure Journeys offers upscale, personalized service that focuses on highlighting the beauty, environmental significance, and astounding cultural diversity of the Ecuadorian mainland and Galapagos Islands. All Adventure Journeys guides and trip leaders are highly experienced and licensed from the Tourism University to operate in Ecuador and certified as Wilderness Adventure First Aid responders. They all have completed several extra training courses for kayaking, rafting, biking, and horse riding, and in addition they are all Ecuadorian and have amazing personalities. In some locations and for some activities, local guides join the trip leaders, practicing sustainable tourism by involving the local indigenous people in the tour operations. Adventure Journeys aims to promote the long-term conservation of both local cultural identities and the environment. They transport out and recycle all non-organic garbage and work with local suppliers whenever possible. Your visit will encourage the local communities to support responsible eco-tourism as a sustainable alternative for their living. Let Adventure Journeys show you the best of Ecuador! First class experience. The adventure was expertly thought out and implemented from beginning to end. We were extremely fortunate to have Christian as our guide. He filled every trekker with the appropriate confidence and preparation to achieve the ultimate goal of climbing Chimborazo. This is a trip that demands a certain level of fitness and ability but is worth every step. The accommodations were first class and the people as well as scenery were magnificent throughout. I am a very frequent traveler, have been all over, seen a lot. Still, the Volcano trekking trip with AJ was one of my best trips! Each day had its own highlights, each day had another type of amazing landscape. It was the perfect mix of activity, nature, culture and fun - with the best guide (Christian) and group we could have hoped for. It's an awesome experience no matter if traveling solo, as a couple, with family, or friends. I can't wait for my next trip with AJ. We could not have had a better trip. Our expert guide knew everything about the local culture, food, and wildlife. Our hikes featured amazing overlooks and beautiful valleys. The accommodations were unique and equally as incredible as the landscape that surrounded them. Cannot wait to travel with Adventure Journeys again. Highly recommended!! The trip was amazing! Christian was a great guide and took very good care of us. The adventures were wonderful, the lodging was nice, and we made memories I will remember for the rest of my life! I really enjoyed the accommodations. They were clean and comfortable. I felt like I was getting to experience the “real” Ecuador, rather than staying in chain hotels that all look the same. Christian was great! Very knowledgeable and went out of his way to meet our needs. My trip to Ecuador with Adventure Journeys was amazing. The week was full of adventure, culture, and beautiful scenery. I would definitely recommend it! Please note there is a 2 person minimum required per departure date. Do not make travel arrangements until Adventure Journeys has confirmed your departure. Each departure requires a minimum of 2 participants in order to run. Please do not make travel arrangements until you receive confirmation from Adventure Journeys. Can I request my own departure dates? Yes, with a minimum of 4 people. American Airlines, Delta, United, and Copa, among others, serve Quito, Ecuador. Most flights will route you through either Miami, Houston, or Atlanta. Airport transfers are not included in the trip cost, however they can be arranged for an extra fee. Please contact Adventure Journeys for pricing. It is each traveler's responsibility to ensure that proper personal documentation is in place. A valid passport (with a minimum 6 months validity) is required for all nationalities. Contact your local embassy or consulate for the most up to-date visa requirements. How difficult is the trekking? What kind of shape do I need to be in for this trip? The trekking during this trip is considered moderate to challenging. During this trip, you'll journey from the high Andean Mountains to the tropical cloud forest of the Amazon. You'll trek for 3 to 6 hours a day along canyons and volcanoes, and at times at very high altitude. The terrain is irregular and you'll be trekking on dirt most of the time. You should be in good general health for this trip and it is a good idea to prepare for your trip with aerobic activities such as running, biking, or hiking at least 3-4 days per week, beginning 3 months or more before your departure. You'll be staying in clean, comfortable hotel and eco-hostel accommodations throughout your itinerary. Pricing is based on double occupancy. Pricing is based on a shared room (double occupancy). If you’d prefer your own room, you can pay the single supplement fee of $495 directly to Adventure Journeys upon booking. The trip includes breakfast each day as well as 5 lunches and 2 dinners. Some meals are not included to give you some flexibility about where to eat and whom to spend your meals with. Your guide will be happy to recommend the best places to eat and make suggestions for local cuisine. If you have any food allergies or dietary restrictions, please inform Adventure Journeys when you book the tour so they can make the proper arrangements. The trip fee covers most of your costs. However, you should allot at least $120 for meals not included in the itinerary, $120 for guide tips, as well as additional money for alcohol, souvenirs, and other personal expenses. There are a maximum of 16 people in each group. This tour takes you across a wide range of climates and temperature zones, so remember to bring warm, well insulated layers. Throughout the trip a truck will take care of transporting your luggage from place to place so you won't have to worry about carrying everything with you during the treks. However, it is still important to travel light. Are there any vaccinations or other medical concerns related to traveling in Ecuador? The CDC currently recommends that you be up to date on routine vaccinations before traveling to Ecuador, in addition to other vaccines depending on your planned activities and destinations within the country. It is always a good idea to check with your primary care provider whenever you travel out of the country. He or she can provide any necessary vaccinations and offer other health-related advice. While on the tour, all guides are Wilderness First Aid Responder certified and carry a complete first aid kit to deal with any emergencies. The Ministry of Tourism of Ecuador has issued a new law regarding all visitors to Ecuador and the Galapagos Islands. An Ecuador Health Insurance Requirement is compulsory for the length of stay in the country. This is compulsory for all foreigners entering Ecuador as tourists.